Information is being sought on Scots servicemen who signed visitor books at a tea stall in England during their travels in World War One. The Scots were among soldiers, sailors and airmen from all over the UK who stopped at Peterborough East Railway Station during 1916 and 1917. They left messages, poems and drawings in two visitor books at the tea stall. Peterborough Archives Service has found details on many of them, but has appealed for help with others. The appeal for information forms a three-year history project, which will close in January next year. Armed forces personnel travelled through the railway station on their way to and from the frontline. There are a total of 593 entries and the project has so far found information on about 350 of them. But the names of Scots have also been found among entries from other units. As well as Scots, English, Welsh and Irish servicemen, a Belgian and Canadians signed the books. Some of the servicemen only wrote their initials next to their messages at the stall which was run by the Women's United Total Abstinence Council. Those who left their initials but not their full name was a Sergeant JEH of the Gordon Highlanders. He also left a short poem that read: "'Off with a Draft at last. After eighteen months hard work, And should another War draw nigh, I'll never join the 2nd Line." 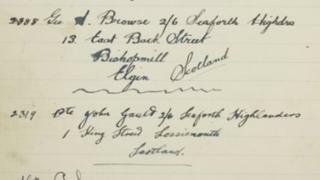 Information has already been found on Scottish servicemen who signed the book, including Linlithgow-born George A Browse, a warrant officer second class with the Seaforth Highlanders. He was awarded the Military Cross for gallantry during the Battle of Arras in 1917. After the war, he settled in Elgin in Moray and played for the football team Elgin United. He was also the model for the town's New Elgin War Memorial. Mr Browse is to feature in an exhibition about the project to be held at Peterborough Museum next year. A spokeswoman for the project said: "Some of the servicemen had a bit of fun with their messages. "One just wrote: 'A son fae Scotland' and another 'A Gay Gordon', a reference to the music and dance associated with the Gordon Highlanders."